Tokyo [Japan], Sep 14 (ANI): Ace Indian shuttler Kidambi Srikanth crashed out of the ongoing Japan Open after being defeated by Lee Dong Keun of South Korea in the quarter-final of the men's singles event here on Friday. Jakarta [Indonesia], August 24 (ANI): India on Friday won their fourteenth bronze medal in the ongoing 18th edition of the Asian Games as Prajnesh Prabhakaran lost his semi-final clash against Kantaphon Wangcharoen of Thailand in Men's Singles event of Tennis. Jakarta [Indonesia], August 20 (ANI): Indian men's badminton team bowed out of the ongoing 18th edition of the Asian Games after suffering a 1-3 loss against hosts Indonesia in the quarterfinal match of the tournament here on Monday. Nanjing [China], August 1 (ANI): Rio Olympics silver-medalist PV Sindhu got past her Indonesian opponent Fitriani Fitriani to book her place in the third round of the ongoing Badminton World Championship here at Nanjing Olympic Sports Centre on Wednesday. Nanjing [China], July 30 (ANI): Ace Indian shuttler HS Prannoy kicked off his campaign at the ongoing Badminton World Championship with a thumping straight games win over Abhinav Manota of New Zealand in the opening round here at Nanjing Olympic Sports Centre on Monday. Jakarta [Indonesia], July 5 (ANI): Former world number one Saina Nehwal crashed out of the Indonesia Open after going down against her Chinese opponent Chen Yufei in the second round of the women's singles event here on Thursday. Jakarta [Indonesia], July 5 (ANI): Indian shuttler PV Sindhu is ringing in her 23rd birthday, this time, away from home. 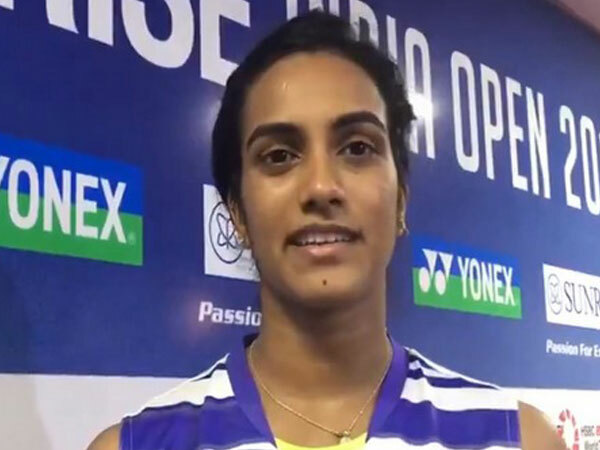 Jakarta [Indonesia], July 5 (ANI): Rio Olympic silver-medallist PV Sindhu cemented her spot in the quarter-finals of the ongoing Indonesia Open after registering a convincing straight-games victory over Japan's Aya Ohori in the second-round of the women's singles event here on Thursday. Jakarta [Indonesia], July 04 (ANI): Former World No. 1 Saina Nehwal swatted aside her Indonesian opponent Dinar Dyah Ayustine with a victory in straight sets to book her place in the second round of the ongoing Indonesian Open 2018. Jakarta [Indonesia], July 3 (ANI): Indian Badminton player HS Prannoy outshined legendary Chinese player Lin Dan in the first round of the men's singles event of Indonesia Open here on Tuesday. Bangkok [Thailand], May 23 (ANI): Following a thrilling 5-0 triumph over Australia on Monday, the Indian men's badminton team led by HS Prannoy made a humiliating exit from the Thomas and Uber Cup after slumping to a shocking 5-0 defeat to China last evening.